King County Metro Transit staff are evaluating the ability to still salvage some of the agency’s widely panned Capitol Hill restructure. Born out of a larger Link Connections process to integrate local bus service with light rail, Metro watered down several consecutive proposals for improving routes around light rail until all but abandoning the idea in Capitol Hill last week, leaving many of the densest areas with less service than today. 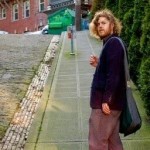 Metro appears to have latched onto a last minute campaign by David Lawson, a writer for Seattle Transit Blog, to revise the Capitol Hill network further. 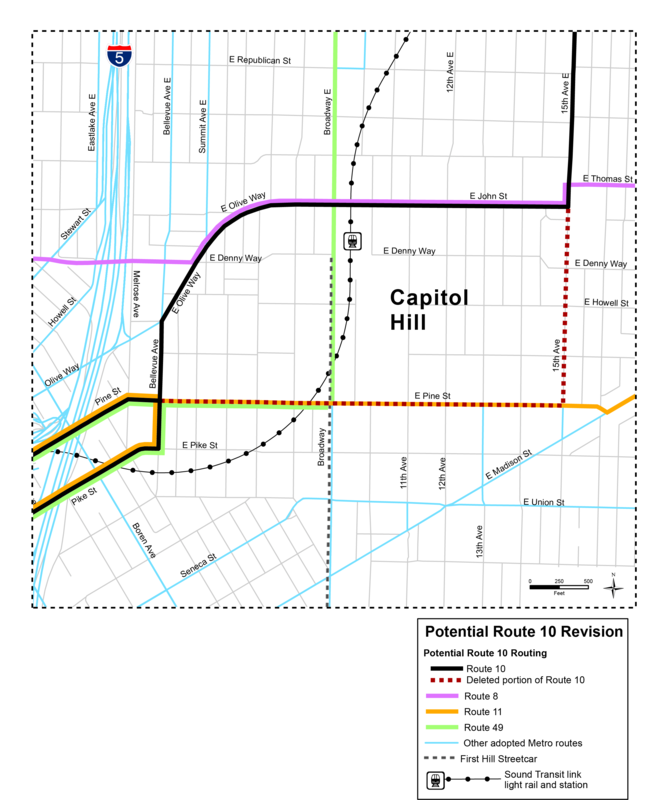 Metro has proposed significant changes to Route 10 that better serve Summit on the north slopes of Capitol Hill. The idea for the reroute was apparently passed over by the Link Connections Sounding Board, but Metro is taking another look. The new Route 10 would turn onto Bellevue Ave E and travel up E Olive Way/E John St just like Route 43 does today. It would then turn onto 15th Ave E and continue to Volunteer Park as usual. With Route 11 put back on E Pine St and E Madison St, there is a large gap in service along E Olive Way and E John St, where Route 43 currently combines with Route 8 to provide very frequent service. The change to Route 10 would provide residents along E Olive Way with another, more reliable connection to Capitol Hill Station, as well as a direct connection to residents along 15th Ave E.
This proposal however does nothing to replace service between 15th Ave and 23rd Ave E, where riders can catch a frequent Route 48 to points north or south; it still leaves the frequent network with a big hole. It also leaves riders on 15th Ave E between E John St and E Pine St without any bus service at all. But as one of Seattle’s densest neighborhoods, west of Broadway, the area should see more bus service connecting it with light rail, not less. Route 10 is one of the most reliable buses on Capitol Hill. Its short route provides a valuable direct connection to a great number of Capitol Hill residents and its improved frequency — thanks to Proposition 1 funds — is adding an invaluable benefit to central Seattle’s frequent transit network. If more people are able to benefit from Route 10 by sending it up E Olive Way and connecting them to a light rail station in the process, it is something worth considering. To be sure, this last minute proposal might only turn out to be temporary. Metro should reevaluate the central Capitol Hill network as light rail service begins and change service as it sees fit. Riders are bound to change their behavior once they realize its benefits. But another major restructure proposal might not come until Madison BRT prompts changes in 2019. The comment period on the proposed revision ends this Sunday (December 13th). If you support or oppose these changes, you’re strongly urged to provide your feedback through Metro’s online survey. Good write up. I would assume that you should comment if you feel like keeping the current route as well.